This is a lot easier than it looks. The finished quilt measures 54″ x 68″. I used 40 Moda Jelly Roll strips to make this patchwork top (without the borders). by using a different number of strips. to have at least 42.5 inches across, not including selvedges. I used 8 of each of 5 different colours. Lay the strips along the ironing board and spray the creases with a little bit of water. Press until dry. Don’t wriggle the iron or the strips may become distorted. Sew together one dark and one light. Press the seam towards the dark fabric. 10 sets of 2 strips. Now, sew the double strips together, light next to dark. You should end up with 10 strips of four going light, dark, light, dark. All seams should be pressed towards the darker fabric. Here are my 10 strip sets lying on top of each other. Now, take one of the strip sets and cut the selvedge off. 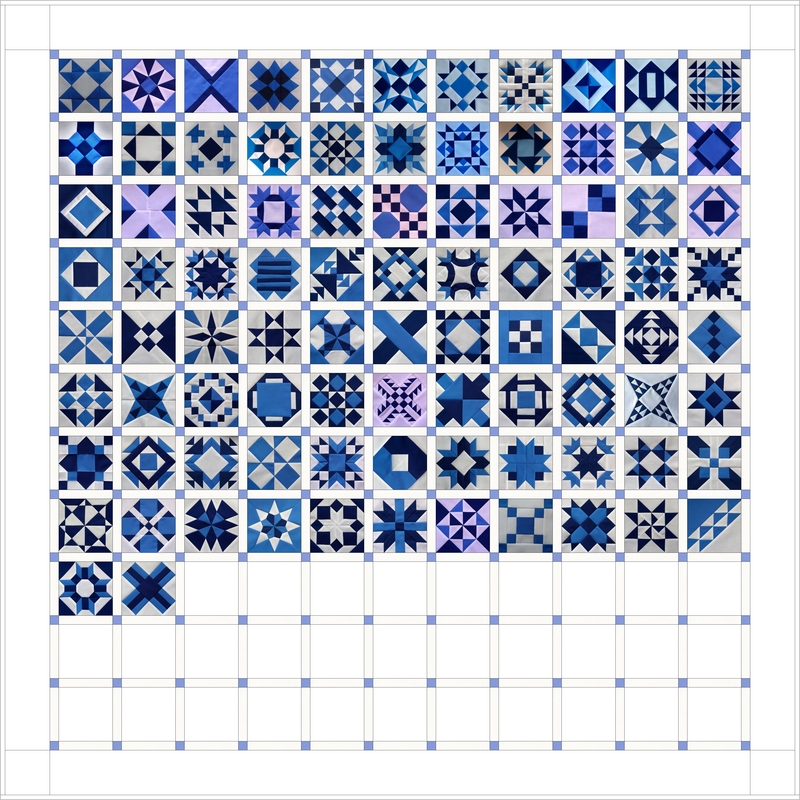 as they all started out at 2.5 inches wide) so I cut off five squares of 8.5 inches wide. top of dark and dark on top of light. handed you might choose to draw from bottom left to top right. “nest” the seams. Then cut along the line. Open and press the squares. Repeat with the other 23 pairs of squares. Then arrange them however you wish. anti-clockwise consistently in each block so the centres are not too bulky. on the back. There are more details about this in my pinwheels tutorial. Wonderful quilt! Awesome colors and movement. Definitely go for it with an MC Escher inspired quilt! Wow – do I ever love how it looks like it’s moving! This is quilt is so visually exciting my eye are having a party haha I love the design, nice job! Have a great time and I am so pleased your lovely quilt will be seen by many others. Can’t join you this weekend, my Birthday today and we are away for the weekend. I’ve loved this quilt since I saw your first post about it! Enjoy the festival!! Very striking quilt! Thanks for sharing it. Love how much movement this has! Going to have to put your tutorial on my “to sew” list, I’ve love to try this sometime. Just beautiful! I’ve got a couple of jelly rolls that and this would work wonderfully! I just love all the motion in this quilt. Thank you very much for visiting my blog. Only one jelly roll is needed and you’ll still have two squares left for a pillow 😀 One of my other readers has already made one of these. You can see photos she sent me in a later post. Enjoy! This quilt is quite striking! I love it! Great quilt. 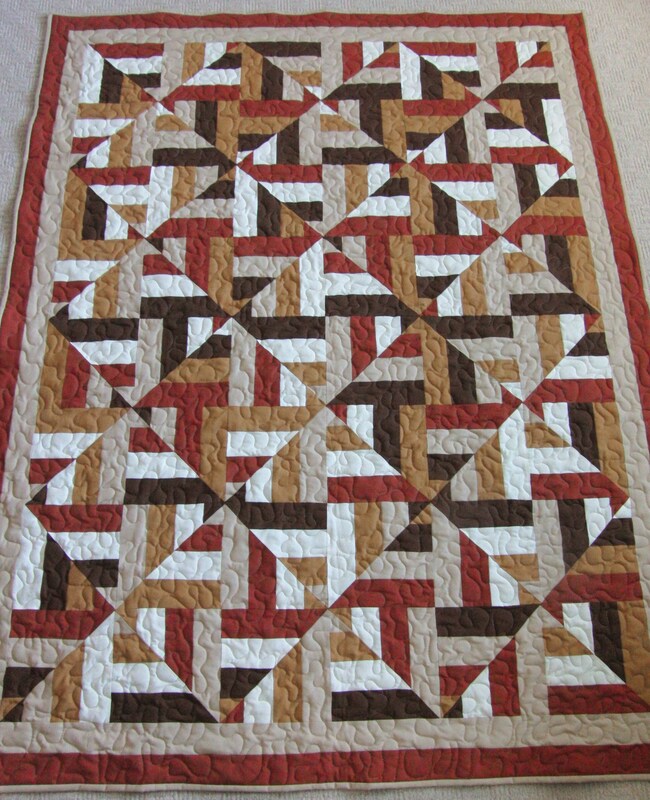 I love the movement – and it looks like you are a precision piecer! Thanks for visiting my blog and your kind comments. I love this quilt! Like you, I love math and geometry. I am so happy you found my blog! This quilt is absolutely beautiful! I must have missed it but can you tell me the dimensions and how much yardage for the borders? Thanks!! Hi Dawn, Thank you for visiting my blog 🙂 The finished size is immediately under the top photo. I cut two and a half inch wide strips for both of the borders and half a yard of each fabric was enough. Enjoy! My strips turned out to be only 8 inches high. Should I cut 8.5 inches wide or do 8 inches wide. Which would cause it to have different dimensions of the finished quilt i know..
Hi, you need to use accurate one quarter inch seams throughout to obtain the sizes given. If you’ve used a different seam size and have only made one strip set, I’d take it apart and redo at the correct size. If you don’t want to do that, then the individual blocks you cut need to be exact squares. I hope this helps. She can auction it off at school for the school. Sounds fabulous! I hope it fetches a lot of cash 🙂 Welcome to my blog Barbara. Thanks for sharing this clear & concise tutorial. I look forward to trying this pattern in some of my favorite colors. Is there any way for you to allow this to be printed? I don’t have the room to have my lap top beside me while piecing. 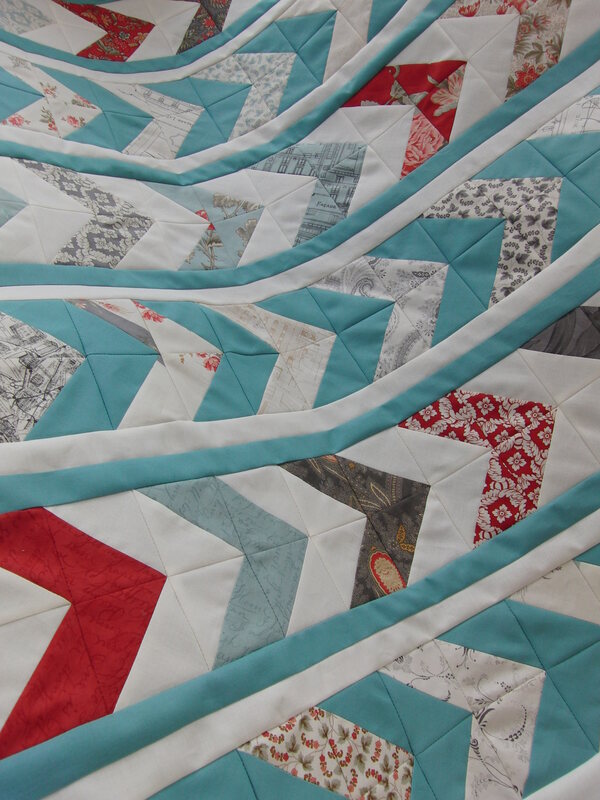 Great quilt, would love to try this! Love this, can’t wait to try it. Thank you for sharing.